Leighton Baines’ drilled penalty in the 28th minute set Everton on their way to three points while Kevin Mirallas added a second before half-time. Everton were comfortable winners in the end and while the maximum points keeps their hopes of finishing in the fourth Champions League spot alive, Manchester United were left to contemplate their lowest ever Premier League points total. Below we take a look at 5 Talking Points from a vociferous Sunday afternoon at Goodison Park. With the prize of Champions League qualification on offer to Everton, the visit of Crystal Palace was as big a game as any; being the proverbial next fixture in the calendar. But Jason Puncheon’s opening goal stunned the Gwladys Street and it became impossible to tell where the nerves that now oozed from the terraces and the field of play originated. Were the players nervous? Or were the fans too expectant that Everton would simply turn Palace over? The defeat seemed to derail Everton’s top four push and Arsenal steamed back into pole position. But Sunday’s atmosphere was electrifying and the players responded to the buzz emanating from the stands with a superb performance. The return of Moyes no doubt played it’s part, but following the disappointment of the 3-2 reverse to Palace, there appeared to exist a communal understanding between players and fans that this game was bigger than getting one over on the old boss. The terraces- including a limp-scythed Grim Reaper who tormented Moyes- were devastating and Everton ensured the gap between themselves and Arsenal remains at 1 point. It’s hard to imagine any manager receiving a guard of honour and an entire stadium applause on their final home game of an 11 year trophy-less tenure. But that’s exactly what Moyes received from the Goodison faithful when it was revealed (with two games left to play of the 2012/13 season) he would be leaving Everton for Manchester United. The majority recognised (and still recognise) the good work Moyes did at Everton, but the ease at which the Scot forgot what good Everton did for him is something Evertonians find hard to forgive. Hence the chants which apparently angered Moyes when the Blues visited Old Trafford in December and the mixed reception he received on Sunday (lets be honest, we were all expecting the boos to ring much louder). The Blue view is that Moyes would have done well to heed his own advice. But these are no longer the concerns of Everton FC. Roberto had a dream, and ginger-haired, dour-faced pragmatists aren’t part of it. Moyes’ Everton were far too predictable. They built a reputation with back-handed compliments. They were ‘hard to beat’, ‘organised’ and ‘gritty’, forever ‘punching above their weight’. While these were necessary attributes in steering a relegation threatened side away from the rocky waters of relegation, they were terribly dull features of a top 6 side. Everton improved under Moyes, but his approach to football matches (especially against top teams we wanted to compete with) never did. It remained negative, realistic and careful. But Martinez has since commandeered the ship and has set his sights on the plunder of Champions League football. More often than not the Catalan has insisted on a pleasing, attacking brand of football but he’s shown the tactical nous to mix it up when necessary. Take Sunday’s visit of Man United for example. Everton at home this season have monopolised possession but they were happy for Moyes’ team to enjoy 61% of this. He put away his trusted ‘death-by-passing’ model for the afternoon, instead ensuring his side had a solid defensive base which was happy soaking up pressure. On the counter, Everton were devastating and it’s fair to say that Martinez ‘did a number’ on his predecessor. When did we ever see Moyes out-fox an opposite number by changing his style? 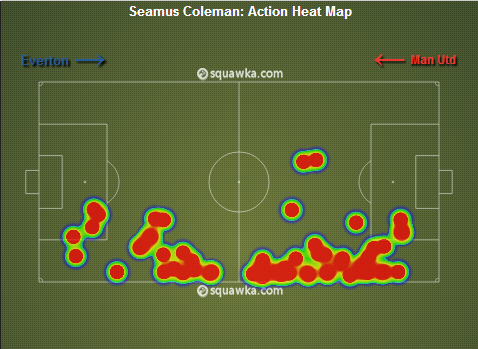 How do we know Coleman & McCarthy aren’t the same person? James McCarthy has enjoyed the ‘Marathon Man’ nickname this season for his tireless, ground-covering performances. But Seamus Coleman has rivalled his fellow Irishman for that title throughout the season and no display seemed to demonstrate this more than Sunday’s. Perhaps it’s taken for granted that Coleman manages to cover so much ground, such is the expectations of the modern full back but the former Sligo Rovers man deserves the plaudits for his marauding runs up the wing and his lung-busting recoveries back. Under Martinez the Irishman has found himself even higher up the pitch but this is not at the expense of his defensive duties. His six league goals and two assists have shown that he is now contributing more than just his presence in the final third; his heat map from Sunday’s game shows just how much time he spent beyond the half-way line. Such is their astounding stamina, can we be sure we’re not seeing one man take the appearance of two breath-taking footballers? Post-match reports suggest Kevin Mirallas will miss the rest of the season having sustained a muscle tear in Sunday’s win. Although there has been no official line from the club, the forward will be a huge loss for Everton should the reports be confirmed. The Belgian drove the Blues forward against Man United, not only helping to relieve the pressure from, albeit rather pedestrian, United attacks but posing frightening problems for the opposition. He complimented his expertly taken goal after a brilliantly timed run with seven attempted take ons and seven crosses. And his combination with Coleman -who assisted the Belgian’s goal- on the right hand side had United’s Alex Buttner filling his pants. Shinji Kagawa’s reluctance to track back often resulted in two-on-one situations and Mirallas was simply too hot to handle. Eight goals and eight assists has made him one of Everton’s most productive players so the news of an injury has certainly come at the wrong time. Can Aiden McGeady or Gerard Deulofeu step up in his place?